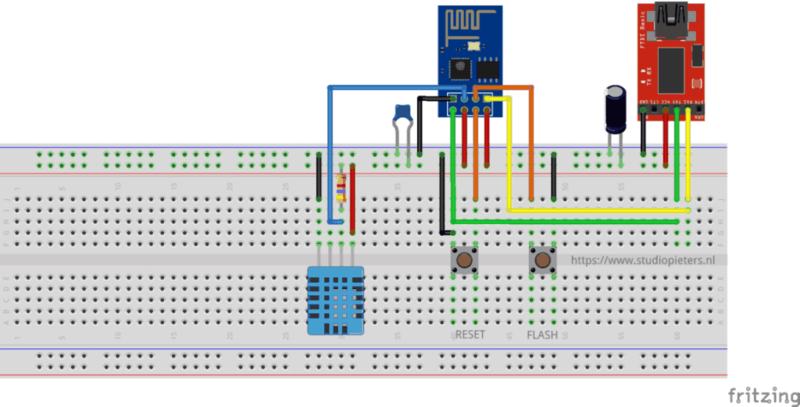 Now that I’ve made at MQTT LED setup in my previous blog, It’s time to make a MQTT Sensor that Sends information rather then only receiving the information. 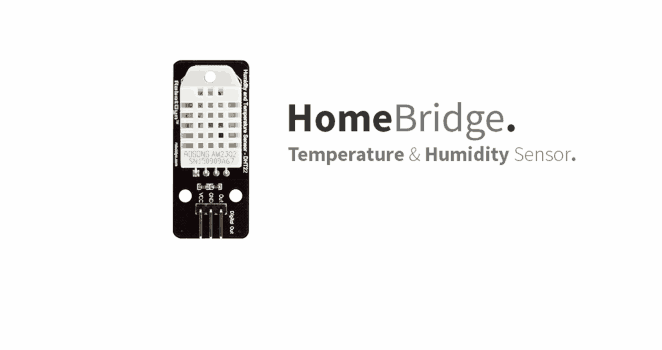 Let’s keep it simple for now and add a Temperature-Humidity Sensor. For this Sensor I use a cheap DHT11 Sensor as it’s only to test if it will work. later on we can use a more accurate sensor. You need to setup your Apple Homebridge based on MQTT first to connect this setup with Apple HomeKit / Siri. For whom did not read my previous blog about setting up your Apple Homebridge based on MQTT you can find it here. When I have collected al the necessary parts, I can setup the test environment like show in the image below. In order to prevent resets, you must include the following three features in the power source to the ESP8266. Sufficient current. A regulated 3.3V source of at least 500ma is essential. Aside from the 300ma peak current needs of the ESP8266, it is essential to also consider the current requirements for other components you have – like the sensors and controls in your circuit. A large capacitor (suggest using 470 uF) across the Vcc to Gnd rails on your breadboard or PCB is a vital ingredient that will minimize reset inducing voltage fluctuations. A 0.1 uF decoupling capacitor across the ESP8266 Vcc to Gnd inputs very close to the pins (within 1/2 inch). DO NOT SKIP THIS COMPONENT! This cheap yet often overlooked component, when missing, is the root cause of ESP8266 resets. To connect this hardware with our Apple Homebridge based on MQTT, we need a MQTT client. There are many open source libraries available allowing you to connect your ESP8266 to a MQTT server. The one I found most stable and complete, is the pubsubclient by Imroy. Note that there are multiple pubsubclient libraries available, so make sure you download the one by Imroy. After installing this library to your Arduino IDE, It’s time to start coding. const char *ssid =  "xxxxxxxx";   // cannot be longer than 32 characters! const char *ssid = "Your_SSID"; // cannot be longer than 32 characters!